Book Review: “Talking Doctrine: Mormons and Evangelicals in Conversation” edited by Richard Mouw and Robert Millet | J.W. Wartick -"Always Have a Reason"
Talking Doctrine: Mormons and Evangelicals in Conversation is a collection of essays from both Mormon and evangelical scholars about the areas of convergence and divergence in their beliefs. It is quite interesting to see how Mormon and evangelical thought has developed through this dialogue and what areas are left open to explore. Some essays hint at convergence of the belief systems (the nature and efficacy of grace, for example), while others show how wide the divide remains (specifically the discussions on the Trinity and issue of theological anthropology). I appreciated the calls to honesty in the dialogue on both sides, as well as the tone of each essay which suggested mutual respect even amidst a struggle to understand each other. One thing that I am really left wondering is how much the Mormon side in this dialogue represents the “Mormon on the street.” That is, would the average Mormon hold to similar beliefs as those writing the essays herein? Often, it seems that the Mormons do not sound all that far from evangelicalism on some issues, but on others the chasm is very wide indeed. Several of the essays were, frankly, overly optimistic. Sarah Taylor, in “An Evangelical at Brigham Young University,” has a conversation with a Mormon friend in which the Mormon friend affirms the possibility that God the Father sinned, but argues that Christ’s atonement would have canceled out even that sin. Shockingly, Taylor’s conclusion is that the Mormon friend was “the same amount Christian” as she is (emphasis hers) despite the affirmation of God’s sinning. Other head-scratchers like this are found throughout, such as when Brian Birch in “Divine Investiture: Mormonism and the Concept of Trinity” concludes that because Mormonism is similar in some ways to Arianism(though radically dissimilar in others), it can be seen as akin to some form of the Christian tradition (but why should a condemned heresy be concluded to be part of the Christian tradition? how broadly are these scholars painting to be inclusive?). However, each essay has several intriguing points to take away alongside various insights and challenges. Whether you are an evangelical looking to broaden your understanding of Mormonism or an apologist looking to see some of the most challenging contrasts to evangelicalism found in Mormon thought (or anywhere in between), this is a book that will benefit you. Talking Doctrine is a fascinating book with many challenging essays and avenues to explore. Frankly, if one is interested at all in apologetics and Mormonism, one should read this book. Whatever shortcomings it has are outweighed by the amount of information found herein. Just be aware of some of these shortcomings. Disclaimer: I received a review copy of this book from the publisher. I was not asked to provide any specific kind of feedback whatsoever. 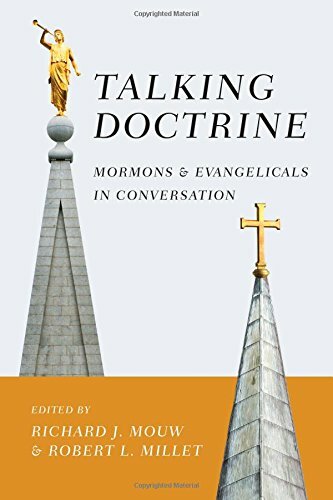 Talking Doctrine: Mormons and Evangelicals in Conversation edited Mouw and Millet (Downers Grove, IL: InterVarsity, 2015). Enjoyed this review, thanks J.W. !